Lisa, stop that racket! I’m trying to fix your mother’s camera. Easy, easy. I think I’ll need a bigger drill. Last week, Stacey wrote about tools that make good Christmas presents. I suggested she include a cordless drill, but apparently she didn’t want to hear about power tools. So I decided to write my own list of most useful tools. 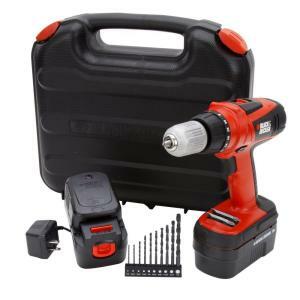 These are the power tools that I would recommend buying first for you or a loved one, because they combine the least amount of money with most amount of usefulness. If you only have one power tool it should be a drill. Corded drills are fine, but I love the easy portability of cordless drills. Get a variable speed one, and it can also be used as a power screwdriver. Look for one that’s reversible, then you can remove screws with it. Of course, the downside with cordless tools is that they can be underpowered and the battery runs down. If you get at least an 18 volt drill, it will have plenty of power. And choose one that comes with a spare battery pack, so that one can be recharging while you use the other. This is like our Black and Decker cordless drill set, only we didn’t get the drills with ours. Our Black and Decker cordless drill is over ten years old. The battery packs still hold a charge well, and it has as much power as when we got it. The next thing I’d suggest is a 10″ miter saw. You might be able to cut a bit deeper with a 12″, but you rarely need that extra depth capacity, and the 12″ blades are apt to flex. You’ll get a straight cut every time with a 10″ blade. They are faster, which is awesome! They are better at cutting straight and square. They are especially good at mitered cuts (hence the name), which makes coving or molding installation a doddle. 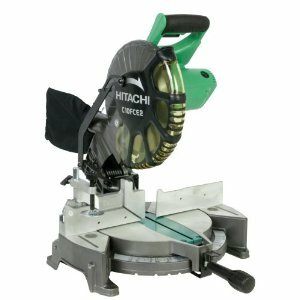 This Hitachi miter saw is not a top of the range tool, but I think it does an excellent job with fewer bells and whistles. By switching blades, you can cut wood, metal, or plastic with a miter saw. Lastly, I’d suggest a handheld circular saw. The miter saw cuts lumber that’s not too wide, but if you want to make a longer cut, a circular saw is a good choice. A handheld circular saw can be a good substitute for a table saw. To accurately cut materials such as plywood, clamp a straight edge onto the material and run the saw along it. Circular saws can cut a variety of materials. By choosing the right blade, you can use it to cut wood, metal, masonry, or plastic. If you’re cutting masonry, it will kick out a lot of dust. Make sure you use a dust mask, because that stuff is lethal. 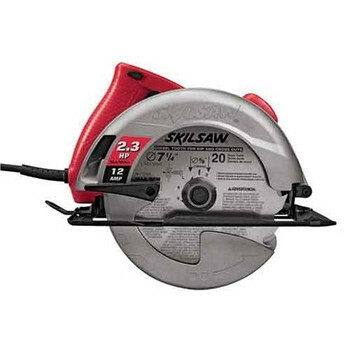 This is like our Skilsaw circular saw. It’s a good solid piece of kit. We have had our Skilsaw as long as we’ve had the Black and Decker drill, and it’s showing no signs of packing up either. So there you have it, my Cyber Monday recommendations for power tools that will deliver the most bang for your buck. This entry was posted in Construction, Repair & Maintenance, Romance, Yard & Garden and tagged gift ideas, handyman gifts, home improvement, power tools, tool gifts, tools, what to get homeowner for present. Bookmark the permalink.